In Acts 8:14-17 states: “Now when the apostles in Jerusalem heard that Samaria had accepted the word of God, they sent them Peter and John, who went down and prayed for them, that they might receive the holy Spirit, for it had not yet fallen upon any of them; they had only been baptised in the name of the Lord Jesus. 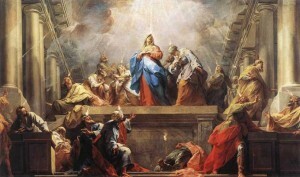 Then they laid hands on them and they received the Holy Spirit”. In Hebrews 6:2, which speak of a laying on of hands for the purpose of bestowing the Holy Spirit. This is especially important because it is not a narrative account of how confirmation was given and, thus, cannot be dismissed by those who reject the sacrament as something unique to the apostolic age. In fact, the passage refers to confirmation as one of Christianity’s basic teachings, which is to be expected since confirmation, like baptism, is a sacrament of initiation into the Christian life. The Church Fathers and early Christian writers also recognized confirmation as a sacrament distinct from baptism, even though it was usually given simultaneously with baptism. Their words speak powerfully about this anointing and imposition of hands for reception of the Holy Spirit and the role it has in Christian initiation. THEOPHILUS OF ANTIOCH “Are you unwilling to be anointed with the oil of God? It is on this account that we are called Christians: because we are anointed with the oil of God” (To Autolycus 1:12 [A.D. 181]). TERTULIAN “After coming from the place of washing we are thoroughly anointed with a blessed unction, from the ancient discipline by which [those] in the priesthood . . . were accustomed to be anointed with a horn of oil, ever since Aaron was anointed by Moses. . . . So also with us, the unction runs on the body and profits us spiritually, in the same way that baptism itself is a corporal act by which we are plunged in water, while its effect is spiritual, in that we are freed from sins. After this, the hand is imposed for a blessing, invoking and inviting the Holy Spirit” (Baptism 7:1-2 8:1 [A.D. 203]). “No soul whatever is able to obtain salvation unless it has believed while it was in the flesh. Indeed, the flesh is the hinge of salvation. . . . The flesh, then, is washed [baptism] so that the soul may be made clean. The flesh is anointed so that the soul may be dedicated to holiness. The flesh is signed so that the soul may be fortified. The flesh is shaded by the imposition of hands [confirmation] so that the soul may be illuminated by the Spirit. The flesh feeds on the body and blood of Christ [the Eucharist] so that the soul too may feed on God. They cannot, then, be separated in their reward, when they are united in their works” (The Resurrection of the Dead 8:2-3 [A.D. 210]). HIPPOLITUS “The bishop, imposing his hand on them, shall make an invocation, saying, ‘O Lord God, who made them worthy of the remission of sins through the Holy Spirit’s washing unto rebirth, send into them your grace so that they may serve you according to your will, for there is glory to you, to the Father and the Son with the Holy Spirit, in the holy Church, both now and through the ages of ages. Amen.’ Then, pouring the consecrated oil into his hand and imposing it on the head of the baptised, he shall say, ‘I anoint you with holy oil in the Lord, the Father Almighty, and Christ Jesus and the Holy Spirit.’ Signing them on the forehead, he shall kiss them and say, ‘The Lord be with you.’ He that has been signed shall say, ‘And with your spirit.’ Thus shall he do to each” (The Apostolic Tradition 21-22[A.D. 215]). CYPRIAN OF CARTHAGE “It is necessary for him that has been baptized also to be anointed, so that by his having received chrism, that is, the anointing, he can be the anointed of God and have in him the grace of Christ” (Letters 7:2 [A.D. 253]). “Some say in regard to those who were baptized in Samaria that when the apostles Peter and John came there only hands were imposed on them so that they might receive the Holy Spirit, and that they were not re-baptized. But we see, dearest brother, that this situation in no way pertains to the present case. Those in Samaria who had believed had believed in the true faith, and it was by the deacon Philip, whom those same apostles had sent there, that they had been baptised inside in the Church. . . . Since, then, they had already received a legitimate and ecclesiastical baptism, it was not necessary to baptize them again. Rather, that only which was lacking was done by Peter and John. The prayer having been made over them and hands having been imposed upon them, the Holy Spirit was invoked and was poured out upon them. This is even now the practice among us, so that those who are baptized in the Church then are brought to the prelates of the Church; through our prayer and the imposition of hands, they receive the Holy Spirit and are perfected with the seal of the Lord” (ibid., 73:9). “Are not hands, in the name of the same Christ, laid upon the baptized persons among them, for the reception of the Holy Spirit?” (ibid., 74:5). 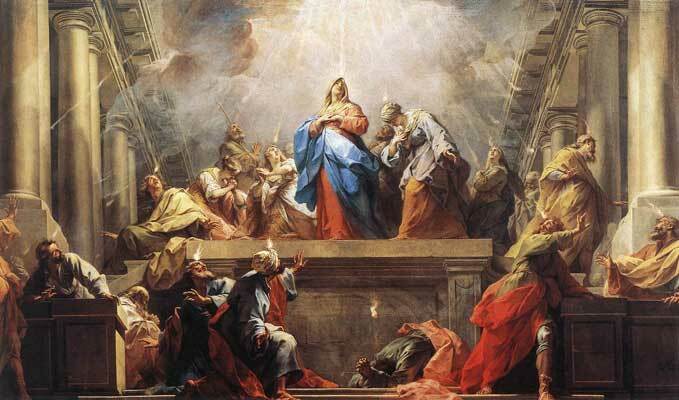 “One is not born by the imposition of hands when he receives the Holy Ghost, but in baptism, that so, being already born, he may receive the Holy Spirit, even as it happened in the first man Adam. For first God formed him, and then breathed into his nostrils the breath of life. For the Spirit cannot be received, unless he who receives first has an existence. But . . . the birth of Christians is in baptism” (ibid., 74:7). Confirmation also as Baptism and the Eucharist is one of the sacraments of Christian Initiation, therefore, it must be explained to the faithful that the reception of the sacrament of Confirmation is necessary for the completion of baptismal grace. Roman Ritual, Rite of Confirmation. 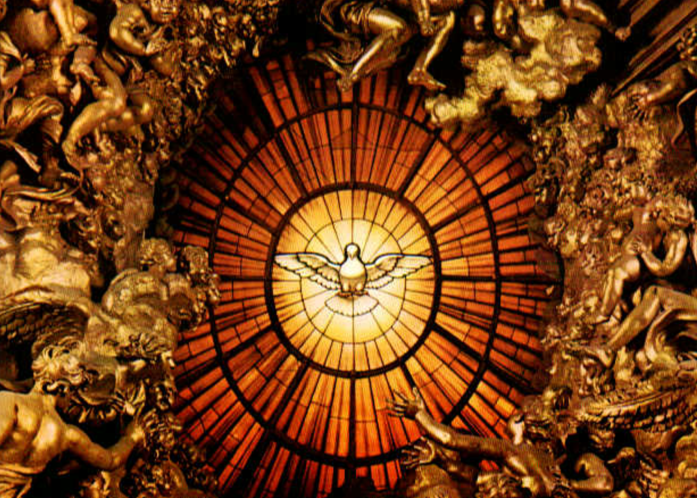 Confirmation completes the grace of Baptism by a special outpouring of the gifts of the Holy Spirit, which seal or “confirm” the baptized in union with Christ and equip them for active participation in the worship and apostolic life of the Church. At Immaculate Conception the sacrament of confirmation is offered to freshman in High School. Candidates must be baptized, have already received Eucharist and Reconciliation, and be enrolled in the Religious Education program at least one year prior to beginning the preparation in the 8th grade. Please contact the Director of Religious Education to begin your child’s preparation for this sacrament at icc.dre@gmail.com. Adults who have not been confirmed are encouraged to speak with one of the priests or deacon about taking part in the Rite of Christian Initiation which is the adult preparation sessions. Â For further information contact the deacon by phone 201 863-4840 ext 28.